The HP large format printing materials portfolio for HP PageWide printing includes recyclable and FSC-certified papers as well as media that deliver quick-dry, moisture- and fade-resistant, reliable prints. Because the paper moves and the printhead doesn't, HP large format printing materials for HP PageWide Technology have been designed for the precise control of paper motion needed to achieve superb results. HP PageWide printing materials are designed to perform with the breakthrough technology provided by HP PageWide printers. The technological advances of HP PageWide printing require special ink formulations and strictly controlled interactions between HP PageWide pigment inks and the paper to achieve high quality printing in a single pass. 21 lb. 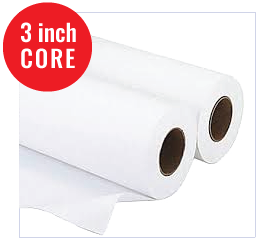 HP PageWide Universal Bond Paper(4.2 mil, 80 gsm - 3 inch core) See precise lines with sharp, fine detail. See high-impact graphics with an extended range of colors. HP Universal Coated Paper (4.9 mil, 90 gsm - 3 inch core)"(4.9 mil, 90 gsm - 3 inch core) From working comps and design proofs to POP signage and special event posters, accomplish more with consistent results every time."